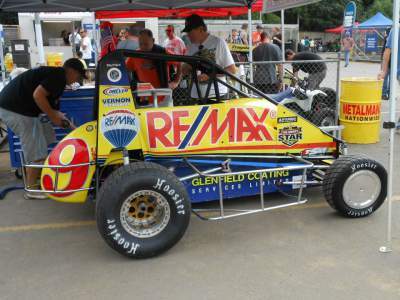 16 cars contested the Midget feature at the John Webster Memorial. For some reason a 10-car invert was applied to the grid leaving a front row of 81h Dayne Maxwell and 10s Campbell Stewart. Row two was 33a James Cossey and 71a Breyton Davison. 25a Scott Buckley and 91a Hayden Guptill occupied row 3. 22a James Earl and 5a Brock Maskovich were row 4. 21a Carl Worboys and 1nz Michael Pickens were the quick men on row 5. 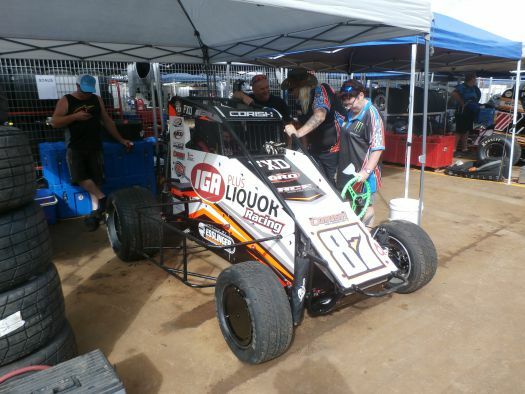 The other driver to watch was 2nz Brad Mosen who hadn't turned a lap in anger all night chasing mechanical issues. He would start dead last on grid 16. Track conditions were good. Though per se a cushion had not formed, drivers could utilise different lines. Broadly speaking there was a high line and a low line but lines were only limited by a drivers imagination. There was a rut out wide through the middle of 3&4 but it was hardly a car killer. The race got underway to a flurry of early action. 18a Leyton Kendall was out early, completing a trio of DNF's on the night. 10s Campbell Stewart took the early lead and when 81h Dayne Maxwell spun to the infield out of the second position Stewart had a gap. The field was stagnant for the first couple of laps. Maskovich made a couple of moves and I believe it was he who had a coming together with 71a Breyton Davison. Davison spun to a stop in Cemetary Bend to bring on the first caution. Mosen was the mover in the early stanza of the race, knocking on the top ten after just three laps. A short and exciting green flag period followed until 1nz Michael Pickens checked up and spun having got perilously close to the back of the Cossey car. At the same time 12a Michael Morrison went over the bonnet of Mosen and rolled on the infield. It was a bizarre incident to say the least. Pickens was off the rear for the restart. If he was going to continue his streak of being first across the line in every New Zealand Midget race this season he was going to be doing it the hard way. Stewart led away from the restart and was quickly joined by Maskovich who had made his way through the frontrunners. Mosen was making his presence felt, joining a gaggle of cars jostling for position in the middle of the top 10. That group was producing some exciting action but all eyes were on the run of Pickens. He was wasting no time in rounding up the field, initially up high on the track before employing the low line to excellent effect. In particular Pickens discovered a line on the pole exiting turn 4. The natural line at Waikaraka pulls drivers out the wall exiting four. Yet Pickens could hook into the pole and in doing so was pulling chunks of time out of his opponents. The best move of his run through the field was exiting turn 4, up the inside of both Mosen and Worboys in one brilliant move. Nobody could stop Pickens run as he advanced to third. Maskovich had found a way past Stewart to take the lead. Both were clear of the rest of the field. Pickens duely ran down Stewart and found a way by. He was now faced with a gap to race leader Maskovich. It wasn't just Pickens providing the entertainment. A mid-pack battle erupted between 25a Scott Buckley, Mosen, Guptill and another driver I can't recall. You could throw a blanket over them lap after lap. Meanwhile Pickens was closing the gap, down low in 3&4 and up high through 1&2. Sure enough Pickens caught Maskovich with around 4 laps to go and launched a magnificent move, high wide and handsome through turns 1&2. 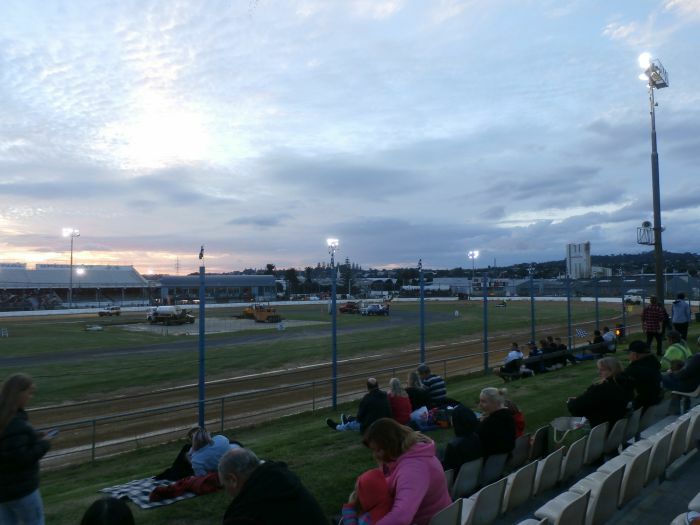 The crowd showed their appreciation as the best New Zealand driver to ever pilot a Midget took the lead. From there it was a foregone conclusion. Pickens taking yet another feature win from Maskovich, Stewart, Mosen, Buckley, Maxwell and Guptill.